All Seasons Resort Lodging dwarfs the competition with impressive year-over-year growth. Through rate optimization strategies, aggressive marketing, and superior service, we are able to keep rooms full of happy guests at outstanding rates, even when the market is struggling to hold onto travelers. When your second home is an investment property, you want guests to come and go, but not your property management company. At All Seasons Resort Lodging, we’re committed as partners for the long haul. All Seasons Resort Lodging was established in Park City, Utah in 1999 with just three properties, and has since grown to represent over 350 vacation rental properties throughout the world-class ski town of Park City, UT, beautiful San Diego, CA, and historic Santa Fe, NM.. All members of our executive team each have 20+ years in hospitality management, including senior positions with Marriott and Starwood International. You can rest easy, knowing that your investment property is in good hands. Quickly see what your property can earn when you partner with Park City’s premier property management company. Yes, Please I would like a representative to contact me with a detailed estimate. Please send me occasional updates from All Seasons Resort Lodging. Through careful use of our rate optimization strategies, aggressive marketing, and superior service, we are able to keep rooms full of happy guests at outstanding rates, even when the market is struggling to hold onto travelers. We go far beyond the simple pricing schemes offered by most property management firms. Our dedicated revenue management team crafts a dynamic rate strategy that will ensure that your property receives bookings throughout the year, leaving nothing on the table and maximizing every opportunity for revenue. All Seasons Resort Lodging employs powerful, custom software that allows us to track and analyze the data we collect to stay ahead of the market and maximize your earnings. Our database provides proprietary insights that allow us to stay ahead of the curve and provide our owners with best-in-class revenue returns. 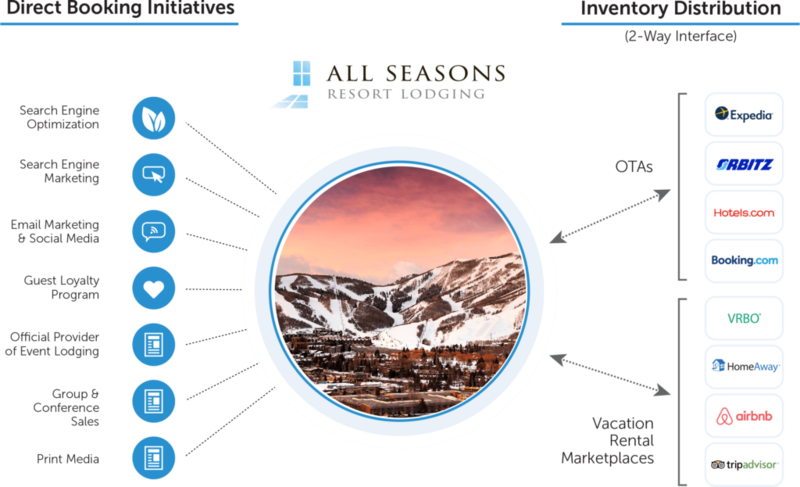 With specific expertise in Internet marketing, revenue management, and direct-to-consumer sales strategies, All Seasons Resort Lodging starts with a critical competitive edge that few rivals can touch. We showcase each home throughout all distribution channels, rather than just the management company website. We believe this results in greater market penetration, increased rental returns and improved guest satisfaction. Happy guests are the backbone of vacation rentals. Every decision we make is focused on providing a positive experience for our guests. Not everyone has the best interests of your property at heart. If it becomes clear during the reservations process that your prospective guests are unsuitable to stay in your home, our reservations specialists are instructed to refuse the reservation. We do our best to keep suspicious characters, wild parties, and other unsavory elements from harming your property. The maximum occupancy refers to the number of people who are allowed to be on the property at any time, not just for the night. Guests are warned that parties at the home are not permitted. Both neighbors and local managers reserve the right to inform necessary authorities if there is a noise violation after 10pm. Local managers are vigilant when discerning the difference between appropriate guest celebration and misuse of the premises. When damages inevitably occur during guest stays, All Seasons Resort Lodging is prepared. As soon as damage is identified by our staff, it is immediately reported and addressed. For time-sensitive damages totaling less than $200, All Seasons Resort Lodging will immediately make repairs and deduct those costs from the monthly statement (only if the guest is not deemed responsible). We notify owners of all damage promptly and confer with them regarding any required repairs of more than $200. The guest is charged for all damages for which they are responsible. To help protect against unintentional damage or accidents, guests are automatically charged three percent of the gross lodging cost is bundled into their reservation as an accidental damage protection fee. This fee is applied first toward any little accidents that may occur during a guest visit. We don’t believe in taking chances. Your home is a treasure that deserves to be protected as carefully as possible. All Seasons Resort Lodging is fully licensed and bonded, and is responsible for damages that may occur as a result of our negligence, and we hold all guests responsible for damages caused during their stay. But accidents, disasters, and one-in-a-million occurrences do happen. To protect against these unforeseen perils, we ask that all homeowners maintain a comprehensive liability insurance policy in a minimum amount of $1,000,000 that specifies All Seasons Resort Lodging as an additional insured party. This insurance protects your home from the unexpected and the unlikely, just in case something does happen. In the case that the need arises, we will utilize your insurance to get your home back in order as quickly as possible. The property shall not be used at any time by more than the amount of adults and children specified by the reservation. No smoking is permitted in the home. Guests are liable for all damage that occurs during their occupancy and agree to accept charges on the credit card placed on file during check-in to complete necessary repairs to the property. Travel Protection: If Travel Protection is purchased, the guest will receive a full refund for any nights of his or her reservation canceled due to death in the family, illness, flight delays, flight cancellations, or road closures due to severe weather. All deposit and cancellation policies. To help you achieve your vision of the perfect rental property. All Seasons Resort Lodging provides a program to help finance improvements and upgrades—interest free—for up to six months. This grant is paid back to All Seasons Resort Lodging on a schedule that aligns with the months that produce the highest revenue. You will have a single point of contact, an advocate who can help you get the information and assistance you need. Not only can your liaison offer answers to your questions, provide expert local advice, arrange owner stays, and provide a complimentary consultation for upgrading your unit, they can offer a range of interior design services, special contractor rates, and other miscellaneous tasks to enhance your ownership experience. Your liaison can serve as your local project manager, keeping any contract work on task and on budget. Your home is yours. You are free to utilize it whenever you wish. Your guests, however, are paying for their time in your home, and we must honor their reservations. If you wish to stay in your rental property, you will need to contact your homeowner liaison to reserve those dates. The further in advance you can block out your dates, the better. That ensures that you are guaranteed the time you want in your home, as well as giving our reservations specialists the assurance that they can freely assign guests to your unit without fear of conflicting with your plans. If you decided you don’t want to actually use those dates, you can simply release them for rental use again. Simply said, with All Seasons Resort Lodging, you can rest easy. If you are interested in learning more about vacation rental services offered by All Seasons Resort Lodging, please contact us at 435-615-0176 .